Kerry U21 football manager Jack O'Connor. 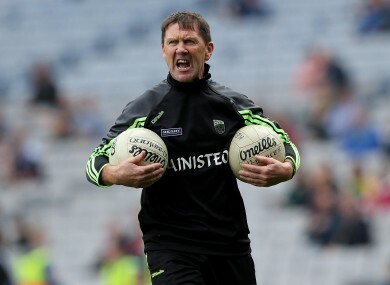 KERRY BOSS JACK O’Connor is resigned to being without four All-Ireland minor winners for his U21 football team’s opening game against Tipperary in the EirGrid Munster championship. O’Connor guided Kerry to 2014 All-Ireland minor glory against Donegal but some players he worked with on that occasion are now marked unavailable. Goalkeeper Shane Ryan, midfielder Mark O’Connor, full-forward Liam Kearney – who captained that side – and Liam Carey, who came on as a substitute in the final against Donegal, are all sidelined with long-term injuries. Mark O’Connor also won an All-Ireland minor title last September when he captained the triumphant Kerry team against Tipperary while An Ghaeltacht player Rob Ó Sé is another player out through injury. Kerry take on Tipperary on Wednesday 9 March in Austin Stack Park at 7pm. “We have a fair idea in our own mind about the team and the panel but we have a share of injuries and we’re just hoping that some of them will have cleared up,” said Jack O’Connor, when speaking to Radio Kerry Sport. Three other members of that successful 2014 minor side are battling injuries but O’Connor is hopeful they will recover. Kerins O’Rahilly’s Cormac Coffey was left half-back two years, Dingle’s Barry O’Sullivan played midfield and another Dingle club man Matthew Flaherty started wing-forward. Injury ruled O’Sullivan out of UCD’s recent Sigerson Cup winning weekend. “Cormac Coffey has just come back from a Gilmore groin injury, he’s on the way back,” outlined O’Connor. “Matthew Flaherty has a bit of a knee ligament (injury), as has Barry O’Sullivan. “So we’ve just been hit with a lot of injuries to fairly important players. Poll: Who do you think will win this year’s Leinster U21 football championship? Email “Jack O'Connor missing 4 All-Ireland minor winners for Kerry's Munster U21 opener”. Feedback on “Jack O'Connor missing 4 All-Ireland minor winners for Kerry's Munster U21 opener”.